Media coverage of a recent report by a California-based cannabis distribution company has caused rampant confusion and hindered lobbying efforts to accelerate the process for making permanent a wave of temporary grow licenses that will soon expire in the state. The report that San Francisco-based Vessel Logistics disseminated March 18 claimed overproduction by California cultivators could pose a “systemic risk” to the industry and warned marijuana farmers that wholesale prices could potentially be subject to a dramatic fall. According to the report, 1,142 acres of state-licensed cannabis cultivation could flood the market with up to 9 million pounds of product, far more than the 1.8 million-2.2 million pounds the wholesale market could allow. Vessel Logistics’ report was picked up by several media outlets, including The Sacramento Bee, Benzinga, Newsweek and Lost Coast Outpost. Headlines such as the Bee’s – “California is growing so much marijuana it could crash the market” – raised eyebrows among some in the industry who see the expiration of temporary cultivation licenses as a much larger – and immediate – concern. “It did some damage to our ability to draw attention to the fact that licenses are expiring,” said Jackie McGowan, a Sacramento-based cannabis consultant. In a phone interview with Marijuana Business Daily, D’Acona emphasized he’s not claiming there will be 9 million pounds of production. 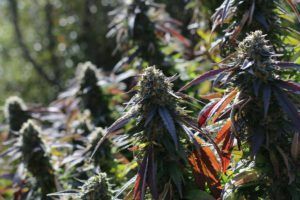 His prediction: In late August or early September, when the mixed-light cultivation operations in Northern California release legal product that’s been tagged through the track-and-trace system, the market will become oversaturated. When the report was released, industry consultants and lobbyists were feverishly working in the statehouse to convince lawmakers to push through Senate Bill 67, which would amend a section of the California Business and Professions Code to extend temporary business licenses until the end of 2019. The measure likely would not become law until the end of May. Without the extension, SB 67 would provide, thousands of these temporary permits could expire before regulators can approve annual or provisional licenses. As of Friday, licenses that accounted for 406 acres of cultivation had already expired, according to McGowan. However, the need to pass SB67 could be rendered moot if Gov. Gavin Newsom were to issue an executive order extending the lifespan of all temporary marijuana business permits. Talk of such an action surfaced Friday, McGowan said, though the governor’s office wouldn’t comment. “We are hearing reports that the administration has met with some industry representatives and legislators about issuing an executive order to bridge the licensing gap and that this announcement will happen very soon,” she wrote in an email to Marijuana Business Daily late Friday. If all the firms with temporary licenses obtained annual or provisional permits, the state could face a glut of cannabis, but that’s not likely until 2020, McGowan said. According to Fraser, a strong demand exists for bulk biomass – trim or underdeveloped flower – to be made into oil, as well as for retail-ready, top-quality flower. “Certainly not an oversupply when it comes to that,” she added. Kristin Nevedal, the Garberville-based executive director of the International Cannabis Farmers Association and board member of the California Cannabis Industry Association, said she’s also heard manufacturers are looking high and low for biomass. “If (we are) getting contacted by companies who want to meet our farmers looking for biomass, there’s probably a lot of that going on,” she added. Anecdotally, McGowan provided a range of wholesale prices from retailers in the state who said indoor-grown flower is selling on average for $2,800 a pound, greenhouse-grown for $1,300 a pound and outdoor for roughly $900 a pound. Fraser said she is seeing top-shelf flower sell for $25-$30 per eighth of an ounce on the wholesale market, with the lowest-quality flower selling for around $10-$15 an eighth. That factors to a range of $1,280-$3,840 per pound. Josh Drayton, communications and outreach director for the California Cannabis Industry Association, said he recently spoke with a grower who was getting $3,000 a pound wholesale for flower, though he’s heard some growers are fetching as low as $1,800 a pound. Both states have seen wholesale cannabis prices slide because of overproduction. One reason it’s difficult to accurately assess the amount of supply in the legal market is California’s track-and-trace system hasn’t been fully implemented. The state system, known locally as CCTT, went into effect Jan. 2, but only for businesses with annual licenses, of which there are only about 100, with hundreds more still operating on temporary permits. Morgan Paxhia, co-founder of San Francisco-based Poseidon Asset Management, said he’s aware of several choke points in the supply chain, including lab testing and packaging requirements, which lead him to believe the inventory of legal cannabis is constrained. The state of California is feeling the pushback from the Honest market. The legal roll-out was/is corrupt. The Newsom/Ajax loophole was just the first example. Voters have been defrauded by the state. The correct definition of the results of #64 is… Everybody can consume marijuana, make sure it’s legal. Legal MJ is approved by the Bureau of Cannabis Control. For most, Cannabis Control never happened, nor will it. Tax and punish remains the driving force. We received another prohibition, sugar coated to appease the tax collectors also known as industry insiders.